Final year LLB students Tammy Harrison and Jarryd Mardon recently showcased their skills and walked away with the Best Memorial award at the African Human Rights Moot Competition in Cape Town recently. 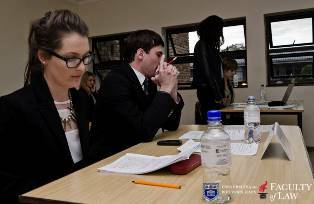 After being selected as the top internal moot students at Rhodes University in March this year, Harrison and Mardon were sent to compete as representatives of the Law Faculty. Standing against law students from across the continent, Harrison and Mardon had to create two arguments, one for imaginary state Khalaharia and another for fictional non-governmental organisation Children of Africa Now (CAN!) in a case that concerned asylum seekers’ rights. Arguments at the competition took place in English, French, and Portugeuse, with Mardon and Harrison placing eighth among the 37 Anglophone countries. They also walked away with the Best Memorial Award for the excellent standard of the heads of argument they drafted, an award both were very proud of, given that drafting heads will be a central part of the career paths they have chosen going forward. “We are both going in to commercial firms so a lot of what we’ll be doing is drafting for advocates that will then argue based on our heads,” Mardon explained. Both Rhodes representatives also greatly appreciated the opportunity to speak with the judges of the competition in between rounds and felt they learnt greatly from this interaction with lawyers at the pinnacle of Africa Human Rights law. “One of the judges said he could see we were a little shaky on the human rights front, but that we were good mootists which was great for us,” Harrison said. Their most positive experience from the event, however, was the interface facilitated between students from different universities across Africa. The conversations took place both throughout the competition as well as during numerous social events, such as cocktail dinners and trips to Robben Island.